Season 2 Episode 4 of the LiveCampWork Podcast! 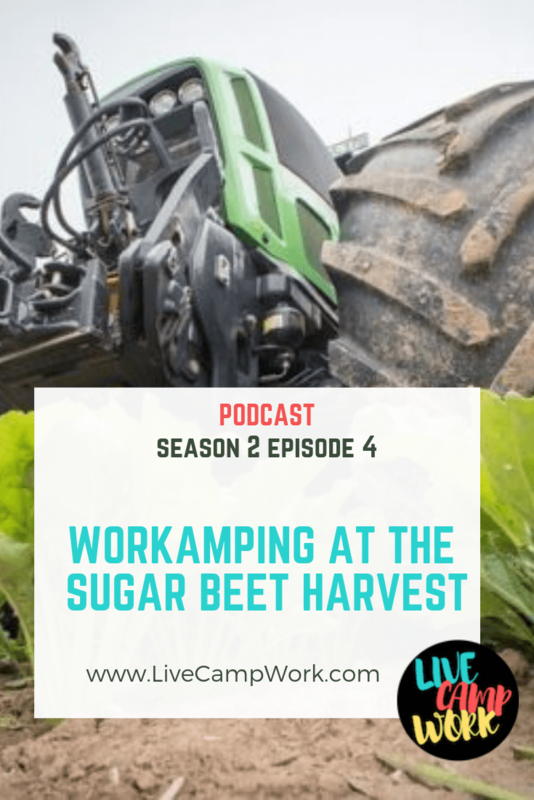 In this Episode, I’m covering the information you need to know about the Workamping program offered by Express Employment Professionals regarding the Sugar Beat Harvest. This program is said to be on elf the most profitable and most intense Workamping jobs for RVers. In just 2 weeks you could walk away with $2500.00- tune in to find out what it’s all about. In today’s episode I’d like to talk about the annual Sugar Beat Harvest- since its pegged as the most profitable Workamping job- where you can make 2500 in just 14 days…. It’s said to be an unbeatable experience, and even though you’re working 12 hour shifts in sometimes freezing weather and covered in smelly dirt- RVers love it and head back year after year for the chance to score big for travel and adventures down the road. The annual Workamper migration starts after the end of the Summer Camping season, when Labor Day celebrations are just dwindling down. Workampers who have hunkered down in the top tourist destinations of the year, now make their way South, heading for snowbird approved destinations for the Fall & Winter months ahead. You may have seen it- the highways are packed with RVers heading south and to the far west, but some RVers have a different idea. They’re pretty easy to spot, since they might seem to be headed in the wrong direction, and as they steadily drive farther north the answer to why they’ve chosen the path less often chosen- can only be explained by the fact that they have their hearts set on racking in big cash before calling it quits for the year! The Sugar Beet Harvest is championed by a collective effort between Express Employment Professionals who hires for the nation’s two largest sugar producers, American Crystal Sugars and Sidney Sugars. Together they actively hire more than 1500 employees to work the harvest each year at 42 receiving stations and 6 factories. Since the local unemployment rate is pretty much non-existent, meaning everyone who wants to work is already working, Workampers are seen by some as the reliable infantry of seasonal help for the booming 5-billion-dollar beet industry. “Workampers are the heartbeat of our operation!” says Express Employment Professions. In fact, if you’re a numbers person, you might be surprised, or at least interested to know that a whopping 42% of these 1500+ positions are filled by Workampers each year! Obviously, Americans love their sugar! 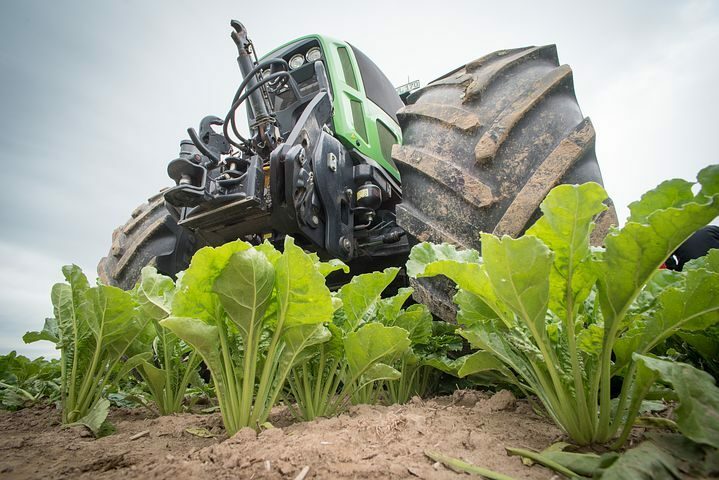 And while working the Sugar Beet is a unique Workamping experience, the hiring team likes to be upfront and honest about the details of this opportunity to ensure that Workampers are making the best decision for their personal situations when deciding if this opportunity is right for them. In a recent online webinar with the Express Employment Team, they made it crystal clearthat these positions and this experience “is not for everybody” so make sure you do your due diligence to gather all the information before submitting your application for this year’s harvest. These are the general job positions Workampers are being hired for. The majority of applicants will be hired for these jobs, as this is the only position Express Employment can guarantee placement in. Basic job responsibilities include collecting beet samples and assisting the Piler Operators in cleaning and maintaining the area. Helpers will also communicate with drivers to ensure safe and accurate unloading of the delivery trucks. 6 indoor positions are offered inside the Quality Lab, where samples are tested to determine the farmer’s pay for their crops: Dock, Tare, Scale, Brei Belt, Brei Mixer & LDB Quality. While these positions are all indoors and only require 10-hour shifts, positions in the Quality Lab are very limited, still require constant standing and are a very important part of the harvest operation. Workampers who wish to secure these jobs, are urged to apply as early as possible. There are a limited amount of skilled labor positions available each year. These positions require past knowledge and operation skills of heavy equipment and applicants will be hand selected by American Crystal Sugars directly. Returning Workampers who have proven their reliability and great work ethic are more likely to be accepted into these positions after year 1 is complete. If you are interested in these positions, send your resume along with your online application and be prepared for an onsite ‘audition’ once you are in the area. Piler Operator: Maneuvers the piler control switches, orchestrates repair work, supervises and assists in the cleanup of daily operations. Skid Steer Operator:Places deep freeze pipes and helps clean and maintain the pile area. As you can probably imagine, the working conditions of the Sugar Beet Harvest will be drastically different from the cozy campground store you might have worked in last Summer. The luxury of sitting for hours on end, chatting with guests about the crowding at the pool and installation of the new sauna should not be compared to the sights and sounds of working the harvest, as this is not a job you accept based on the beautiful view from your campsite, the perks of using the employee golf carts or the ability to explore the local area for new experiences. Working with 32 Campgrounds in the region, part of your compensation will include your site. Once hired on, the HR Staff will make your reservations and take care of all the details including paying for the site. Scott from Express Employment Professionals advised that “Not all campgrounds are created equal. The sooner you get your application in, the better your chances of getting a spot at one of the nicer ones.” Most of the Campgrounds they offer provide a full hook up. If you by chance get a campground without sewer they will offer a honey wagon service free of charge. Also, if the temperature drops and the campgrounds have to shut off the water at the campsite, which has only really happened during the very last part of October when the season stretched out, they would provide a water truck also free of charge to fill your tanks. Some campgrounds will have a campground host on site, but not all are able to offer this amenity. Most of the campgrounds are located very near to towns with gas stations, groceries, laundromats and hardware stores. But heading to Walmart and other big box stores would require more driving and possibly a shutdown day for enough time and energy to make the trip. They ask that Workampers arrive with enough propane and food rations to allow for two full weeks of work without requiring an errand trip to go get more, just in case. The farthest campground is about 28 miles away from the piling site, so make sure you have a reliable vehicle or transportation to get to and from work, as walking would not be an option. Most sites are said to be about a 10-minute commute to work, which isn’t bad and for Workampers without a tow or in town vehicle, carpooling with friendly neighbors is always an option. With the temperatures ranging between cool and windy to dropping below freezing especially during the nights, you have to anticipate the need to layer your clothing. I can’t imagine anything worse than working a 12-hour shift feeling unprepared and uncomfortable in a miscalculated wardrobe choice I could have prevented. Plan to layer your clothing for all shifts! You can always take a layer off if you get hot but trying to find an extra sweater lying around in a pile of beets, I can only imagine would be quite difficult. Insulated gloves, multiple pairs of broken-in boots, a few insoles or heated liners, thermal underwear, snow pants, heavy jackets, face masks, beanies, and hoodies are all recommended essentials! The consensus seems to be that you should make a big trip to the thrift store for clothing you don’t expect to ever wear again! Apparently, the smell of Sugar Beets isn’t all that great and once the dirt gets on you, its stuck! Submit online or by paper application, which they will mail to you. They will contact you for more information and to discuss details to move forward. You will receive some form of contact from your point person every 30-45 days leading up to the harvest. So that’s good that they stay in contact with hires up until the arrival date. How Can I Prepare For This? Working the Sugar Beet Harvest is a strenuous Workamping job that will require some preparation prior to your arrival. During the summer prior to your harvest experience, it is advisable to add daily exercises like jogging, swimming, yoga, Pilates, stretching, and/or light weight lifting to your health regimen. Preparing your body for physically demanding work can help lighten the harshness of the physicality you’ll experience after arrival. Start by slowly implementing exercise into your daily habits and grow to include more over the full course of the summer. Even small efforts like walking your dog more often and for longer periods or riding a bike to the store instead of driving will pay off in the long run! The Sugar Beet Harvest is relatively short, at just about 10-14 working days. The pay is good and starts at $13/hr. Increases are given to returning workers who come back for consecutive seasons and those in skilled labor positions. Shifts are long and span a full 12 hours in most cases, during which you will spend most of your time on your feet. Your campsite is provided FREE as part of your compensation package, and you will not receive a 1099 at the end of the year or see the value noted on your pay stubs. The first 8 hours of your shift are paid at the regular pay rate, while the last 4 are paid at time and a half. Saturdays are paid at time and a half and they offer Sundays at either time and a half or double time- depending on the location. Temperatures drop below freezing usually during the nights, so all employees will need to be prepared to work throughout their entire shift wearing the appropriate layered clothing. Operations can shut down on days when it’s too hot, too cold or too wet. When you complete your agreed commitment, you will receive a 5% Harvest Completion Bonus as an extra thank you for your hard work and dedication to seeing the project through! Basic job requirements require that everyone must be able to lift a minimum of 25lbs.